Alterations in both gastric emptying (GE) andsmall bowel motility have been reported in irritablebowel syndrome (IBS); the relationship, however, betweenthese different measures of upper gut motor function in IBS has not been assessed. 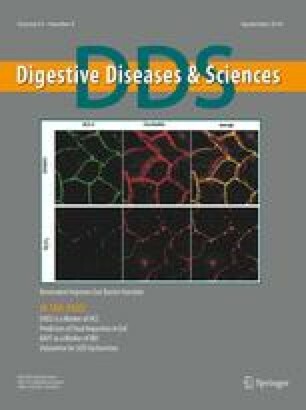 The aims of thisstudy were therefore: (1) to compare the prevalence andcharacteristics of altered small bowel motility in IBSpatients with and without delayed GE; and (2) to assess the interrelationships betweenfasting and postprandial small bowel motility in IBS,accounting for delayed GE. Forty-four IBS patients and25 healthy controls underwent 24 hr ambulant recording of interdigestive and digestive small bowelmotility. On a separate occasion the IBS patients had GEof both solids and liquids measured by a dual-isotopescintigraphic technique. Thirty-nine percent of IBS patients had delayed GE. Patients withnormal GE had no interdigestive small bowelabnormalities. However, in patients with delayed GEfasting phase II burst frequency was higher than incontrols [median 0.21/hr (IQR 0.15–0.34) vs 0.06/hr(0–0,16), P = 0.004]. Postprandially, abnormalphase III-like activity was higher indiarrhea-predominant IBS patients (0–0.08/hr vs0/hr, P = 0.01), than in patients with normal GE or controls. Furthermore, IBSpatients with delayed GE did not have the normalcorrelation between fasting and postprandial motorparameters (percentage occurrence of clusteredcontractions, postprandial pattern duration vs preceding MMC cyclelength). In conclusion, small bowel motor dysfunctionoccurs more frequently in IBS patients with concomitantgastroparesis than in patients with normal GE. These findings provide further evidence that aneuropathic process may contribute to the pathogenesisof IBS in a subgroup of IBS patients.